Very often, much of my inspiration comes from nature. Plants, the environment around us, the colours, shapes, textures and proportions of waves or clouds or leaves or water all inform and inspire the jewellery that I create. Whether it is the leave of a tree, or the surface of a piece of water worn sandstone, the opportunity for design ideas exists all around. Sometimes, however, it is the much more immediate inspiration of particular gemstones that gets the creative juices flowing. On rarer occasions, just very now and again, the thing that really sets the imagination blazing is the sheer awe inspiring work of another jeweller or jewellers. 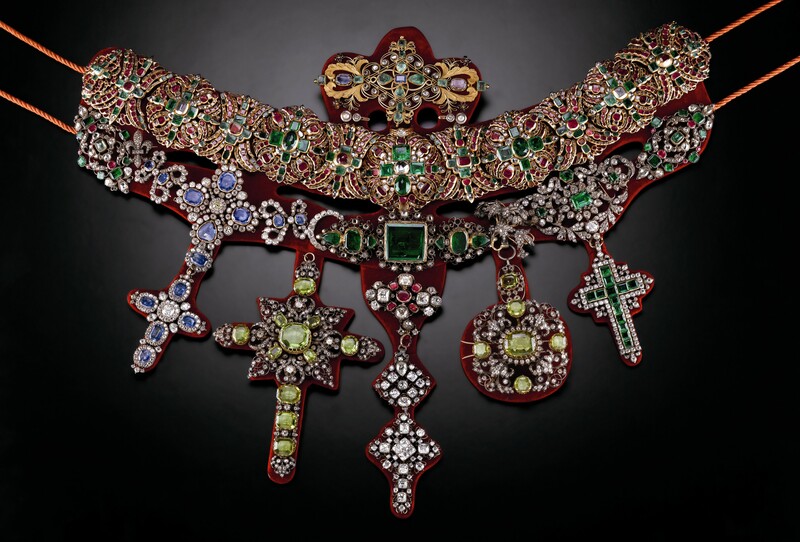 Recently, I was lucky enough to see the jewels of the San Gennaro collection. Even to describe them simply as jewels seems too trivial but much as Bilbo Baggins was without words when met with the sight of Smaug’s hoard I am not sure I actually have the words to do them justice. The jewels and statues and tributes that form the San Gennaro collection are simply breathtaking. From really rather massive emeralds, amethysts, sapphires and peridots, to acres of gold, and dozens upon dozens of diamonds….and so far I have only just described the necklace of St Januarius. So what of the inspiration? Well, I tend to be quite sparse with my use of gemstones, I like space and light around them. For me, the genius of much of the gem set pieces in the San Gennaro collection was that although they were encrusted with gemstones, it wasn’t in an edge to edge pave set way of much modern commercial jewellery, it all had a beautiful spacious light touch to the positioning of the stones, despite the gemstones being scattered all across the surface. And that is a skill I want to acquire! I don’t imagine the turn around will be quick, I think I may need a fair amount of drawing board time to reach the place I’m aiming for, but for the final effect, I am going to give it a go. In the meantime, why the pearl and amethyst birthstone bracelet photograph? Well, despite the high and lofty inspiration, birthday gifts still have to be created and this pretty February birthstone bracelet is a perfect gift, especially as it is one of a kind! With only three of the little flat teardrop amethyst beads to my name, I’ve created the bracelet above and a pair of matching earrings, so once they are gone – they are gone!! It is the birthday of one of my friends at the start of January. January is always a tricky time to find a nice birthday present, it is so hot on the heels of Christmas and yet you don’t really want to get a gift that is a leftover Christmas gift option which tends to be what the shops are full of. Don’t get me wrong, I like a bargain as much as the next girl but typically when buying for myself and not for someone elses birthday. At the same time, I’ve been toying with a birthstone range of jewellery for my crazy for ruthie Etsy shop, as not only are they pretty, but they are a lovely personal gift too. All of this is what inspired the freshwater pearl and garnet bracelet that you see before you. I love the combination of garnets and pearls, especially white pearls. There is something so timeless about their colours together and they also have a real medival feel to them, with a bit of imagination, you can picture an affluent lady of the court adorned in some kind of garnet and pearl get up (or is that just me…? maybe my imagination is over active…). By adding a pretty garnet bead to a linked silver and white pearl bracelet, it seemed to give a lovely combination of the classic wearability of pearls and a lovely hit of deep claret wine red with the garnet. Obviously, garnets are the birthstone for January, but I will make more of these along the same lines for the other birthstones. Birthstones like amethysts and peridot will be relatively easy as there are lovely beads available, but I can see me having to get my thinking cap for for a diamond for April. Including a diamond and having the bracelet affordable do seem quite conflicting requirements at the moment, but there is nothing like a challenge to get the creative juices flowing! As well as the freshwater pearl and garnet bracelet as a birthstone gift, I’m going to create garnet and freshwater pearl earrings too so there is a set available if anyone desires or for those that don’t wear bracelets! You can find the listing for the bracelet here: https://www.etsy.com/listing/175547406/silver-linked-white-freshwater-pearl and I’ll let you know when the earrings make it onto Etsy too! I know, I know, more pink! This time it is a very different shade of pink though, so that makes it completely different – right? The shade of pink of these pearls is pretty incredible. It is a lilac, dark rose, powdery pink that has quite a lot of blue tones in it and so looks stunning when linked together with silver, which is pretty fortunate since that is what I’ve linked the pearls together with. This freshwater pearl and silver linked necklace design is a bit of a favourite of mine, it looks so very elegant and yet can work with a fairly dressed down look too. It is also super easy to wear. For this necklace, I’ve added an extender at the back so it can look quite boho when worn long and perhaps even layered or it can look quite preppy when worn shorter. I’ve also made a pair of freshwater pearl and silver drop earrings to match this necklace and you can find those, and freshwater pearl and silver necklace, over at my Etsy shop. This isn’t one of todays efforts, it is a necklace I listed on Etsy just when I restarted my shop in October this year. However, it is a brand new photograph of this necklace. Although I first registered with Etsy in 2008, it is only this autumn that I got my shop there up and properly running. To start with, I was quite wholly occupied with how hard it is to take good photographs of small shiny things. As a result, the photographs on the first few listings had a variety of backgrounds and lighting as I tried to work out what looked best. I think that the photographs on this white linen are the winners, but if you think differently I’d be glad to hear your take in the comments below. Anyhow, I’m not trying to get a consistent look for the shop and so am working on and off, as time allows, to update the original listings with some new style photos. Which brings me to this necklace, a lovely green adventurine, freshwater pearl and yellow gold necklace in fact, with a focal bead of faceted green adventurine which is an absolute stunner. The freshwater pearls are dyed a dark bottle green so complement the green adventurine really well. This freshwater pearl and yellow gold necklace is still available on Etsy, and if you get time to take a look at it, I’d be glad to hear how you think they new style photographs (white background) compare with the old style photographs (green background) which are still on this listing! I made this pretty freshwater pearl cluster necklace a few weeks back (obviously before my pink phase started) and listed it on Etsy when I re-opened my shop, but today has been so busy with other things that I’ve not been able to make anything and so it seemed a good time to showcase this on the blog. The freshwater pearls are a real contrast, the little ones are a steely, peacock dark grey whilst the large freshwater pearl is a very lustrous white; they complement each other beautifully. Anyway, digressing completely, one of the efforts of the past day or so has been to get an instagram account up and running, so here it is: http://instagram.com/crazyforruthie if you are on instagram, it would be lovely for you to say hello! More pale pink today, although this time the pale pink has a definite lilac tone to it which does have a very December appropriate winter-y feel. I thought the beautiful texture and curves of these freshwater pearls would look perfect with the geometric structural earwires I made previously, so here they are – a lovely pair of pale pink freshwater pearl earrings. These would make gorgeous bridal earrings, especially for a bride-to-be looking for something that is just a bit more edgy than normal but that wont offend the sensibilities of the traditionalists. These earwires are sterling silver but I think that my next project may be a yellow gold pair – perhaps with some white pearls? I’ve listed these pale pink freshwater pearl earrings on Etsy today, and you can see several other images of them there too. Now it is time to go and hunt for the perfect white pearls for a gold pair! Hello – and a lovely freshwater pearl necklace for starters! Its taken a while but crazy for ruthie jewellery has braved website creation and joins cyberspace. I hope you love the jewellery you find here, it is certainly made with a lot of love. One of the things I love working with most is freshwater pearls, so it seems apt to kick things off with a necklace made with the most amazing deep chocolate brown-ish bronze freshwater pearls linked together with silver wire. This freshwater pearl necklace style has proved a real classic and can look fantastic with a dressed up or a dressed down look and the fabulous colour of these pearls means it is perfect for wearing during these winter months. It is truly a one of a kind necklace. The pearls were given to me by a friend who got them on holiday in the Middle East during the days when we were footloose, fancy free and able to do things like that. The likelihood of the stars all aligning for that to happen twice is minimal! You can find it at the crazy for ruthie Etsy shop where it is available to buy or even just to see more photographs of it in its full loveliness.